Spring break! Let’s read some books! Because it’s spring break and I’m furiously trying to get a paper ready for the Population Association of America meetings in May (but paper due on Monday), I haven’t been blogging so much about economics. But I feel like writing about books today, so here goes. BuzzFeed published a listicle of strong female characters in literature we wanted to be when we were growing up. Immediately, I break into a smile because I list many of the same characters as my childhood idols, but the joy dissipates quickly as I remember that so many of those strong women characters faded from my reading list as I became a more advanced reader. A conversation with friends over dinner a few months ago resulted in each of us listing books that were important to us or had inspired us. Each of us came up with books written by women or that had strong women characters that we had read when we were younger, but as we accelerated through our childhoods and into adulthood, Blume and L’Engle turned into Steinbeck and Nabokov. Kids’ books turned into serious literature (I wish I had another font and could make a frowny face to go along with those words), and the women kind of fell off the list. It’s not that I don’t love Steinbeck and Nabokov, I do, passionately. But I wish that I had more books from the intervening period between then and now to say, yes, that one really shaped my life or inspired me to do something in particular or put me on a path to who I was now. Although, with enough thinking, I just came up with The House of the Spirits by Isabel Allende, which in large part pushed me to study Spanish. I’ll take it, but I want more. One of the best parts of my decision to read only female authors in 2014 has been that everyone has a good book to recommend to me. At least among readers, most everyone I know has a book or writer that was totally unknown to me before and now makes up part of the growing list of books I want to read. My neighbor is constantly sending me texts with new books. I get random emails from friends with lists. Days after we’ve talked about it, someone will approach me with another idea. There are lots of great books by women, we’ve just somehow managed to push them down and ignore them in the face of all the other options. Some of the talk around reading women centered on this idea that focusing on it only magnified the problem. For me, focusing on the gender of the writers I’m reading and the voices I’m letting into my head has opened up this incredible fountain of books. I can’t wait to dive into the next one. Happy Spring Break. And Happy (almost) First Day of Spring! Author ekfletchPosted on March 19, 2014 March 19, 2014 Categories BooksTags Read Women 2014Leave a comment on Spring break! Let’s read some books! Eight months or so ago, I was reading a book that had been recommended by a friend. It had been written by a white American male, likely in his mid- to late-forties, and was seriously depressing me. It was whiny, narcissistic, vain, boring, and even more frustratingly, almost entirely the same voice, character, and even plot lines as a book I’d just finished. I don’t even remember what it was, but I put it down and didn’t pick up a book again for a few months. I had a few subsequent conversations with friends about how I wanted to read more women writers, but it didn’t go very far until I happened to read two novels by women while on vacation and came home from Zimbabwe to the #readwomen2014 discussion on twitter. I found the idea immensely refreshing, and after a few days of thinking, decided to make 2014 my year of reading women. A chat on Saturday with Alyssa Pelish (who occasionally writes for Slate’s Lexicon Valley, among her many other talents) only reinforced my resolve to participate. As a scholar who spends a lot of time focused on gender and women and how to reduce violence and discrimination against women and girls, it felt kind of incredible that I would let such a large part of my leisure time be dominated by male voices. I realize I can’t entirely eliminate male voices from my reading list. One, I’d never get any work done, and two, I’d know very little about what’s going on in the world. 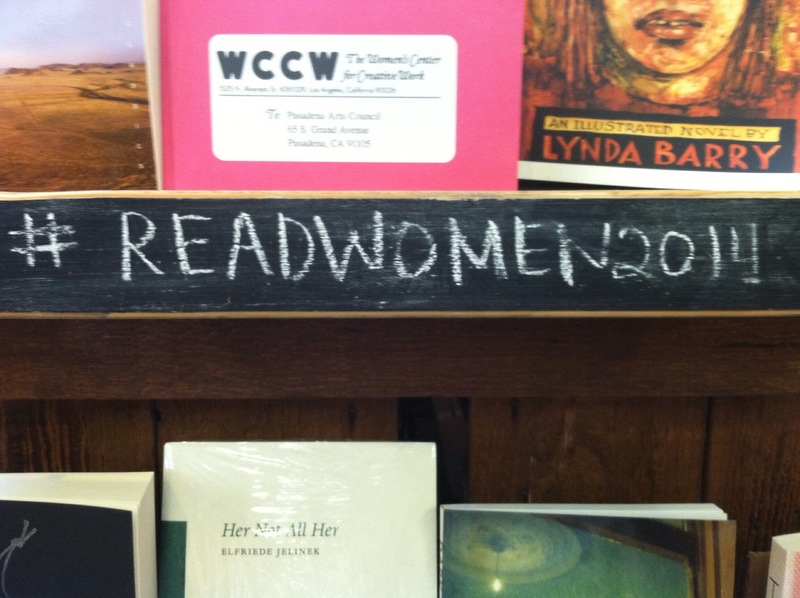 The #readwomen2014 conversation has produced several fascinating viewpoints both for and against such an exercise. I have a short list of reasons why I’m choosing to engage. For me, it’s about adding new voices, new experiences, new perspectives, and specifically female ones. I could probably embark on a similar experiment to only read writers of color–and perhaps next year I will–but right now, I want female voices and perspectives. On a larger, grander scale, I hope that buying books by women means that I talk about them more, that they get read more, and thus published more, and thus talked about more. I recognize some of the futility of that stance, and that choosing to ignore both other underrepresented groups and men might mean that I miss some good things, but I’m okay with it. A year is not that long and I’m confident I’ll find lots of good books. I have a great list of novels and authors going, mostly thanks to Alyssa and Katina Rogers, but ideas and suggestions are most welcome. Wish me luck! I’m starting February with Doc: A Novel by Mary Doria Russell. Also, if you have a minute, take Alyssa’s survey on prepositions. Last summer, I met an old friend for drinks in Boulder. We had once been friends who shared our fiction writing and talked endlessly about the books and short stories we were reading and how we were thinking about writing different characters and story lines. You can imagine my embarrassment when he asked what I was reading and I couldn’t think of a single thing that didn’t have the words “poverty,” “development,” “poor,” “family,” or “gender” in the title. As a result, I started devouring Faulkner, and have been since been making more time for fiction. Over the winter break, I happened to read two very enjoyable books in quick succession with similar themes: time, memory, writing, sexual oppression and violence, gender, and even some academic inquiry. If I had a literature PhD instead of an economics one, I’d probably write a paper on Ruth Ozeki’s A Tale for the Time Being: A Novel and Margaret Atwood’s The Handmaid’s Tale. One has elements of the Murakami-like magical realism and one is more a dystopian fantasy, but both are excellent reads and highly recommended. By coincidence, I also happened upon the #readwomen2014 conversation on twitter this morning (h/t @berfrois). I can definitely get behind a great list of women writers. I can’t wait to explore. I’m still reading the other stuff of course. In fact, I spent Christmas morning before everyone got up with Justice, Gender, And The Family, much to the consternation of my family and friends. Doesn’t everyone read feminist tracts while waiting to open presents? No? Y’all are missing out. GBV and social norms. By me! In print! I’m constantly amazed at both how long the publishing process is and how quickly the years have gone since I started a handbook chapter with my wonderful, talented colleagues, Betsy Levy Paluck and Laurie Ball Cooper. I’m happy to say that today, the The SAGE Handbook of Gender and Psychology is available for sale and has some great essays on gender, including ours on gender based violence and social norms around the world. Author ekfletchPosted on September 25, 2013 Categories BooksTags publications, researchLeave a comment on GBV and social norms. By me! In print! Woohoo, Spring Break Reading List! It’s Spring Break for Gettysburg College, which means I have jetted off to somewhere it decidedly does not look like Spring. Well, perhaps at least in the conventional definition. I’m quite happy to see snowflakes my entire break, but many of my students were appalled that I wasn’t heading south for warmer weather. Oh, well. A break from classes means work with new data, getting caught up with student blog posts, and of course books. Below is a peek into what I’m reading this week, though it likely won’t be the last you hear from me about these books. The Warmth of Other Suns: The Epic Story of America’s Great Migration I wish I’d had this book when I taught labor last semester. We talked about the Great Migration, mainly in the context of a lesson on labor mobility and this article by Leah Platt Bouston. It’s clear from Wilkerson’s meticulous, intense research that there remain many stories to be told about the migration of Black people from South to North throughout the 20th century. The storytelling is incredibly compelling, as well. Far From the Tree: Parents, Children and the Search for Identity This is another behemoth of a book that has totally captivated me after only two chapters. The first is intensely personal and really beautifully written; I’m excited for more. Understanding the Gender Gap: An Economic History of American Women (NBER Series on Long-Term Factors in Economic Development) I consider all of these books “work,” which is why I love my job, but this is really work that might lead to a publishable, scholarly work. After reading Wilkerson’s book, I had a paper idea, so I’m brushing up on my working women history in America. It’s a must-read (or re-read in my case) for anyone who cares about gender and work, even if it lacks some of the artistry of the above books. Author ekfletchPosted on March 12, 2013 Categories Books, Culture, Family, Gender, WorkLeave a comment on Woohoo, Spring Break Reading List!